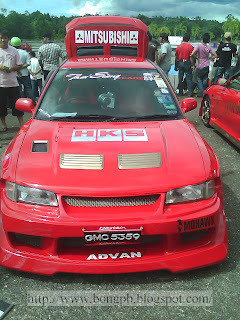 Today I just had a chance to go to Stadium in Kuching to witness a relatively small scale of car show. 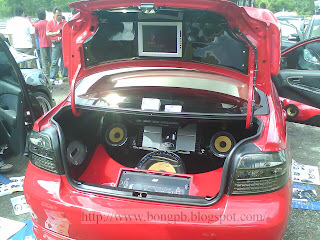 It demonstrates lots of different car with different car audio system, namely from MTX, Helix, Pioneer, Sony, Soundstream, and etc. 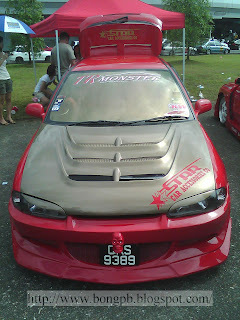 There were some cars with extreme body kits too. This is by far my favourite car. 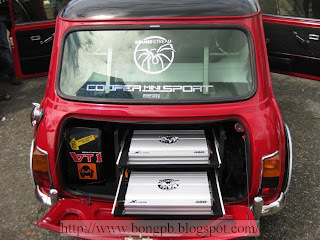 This Sport Mini Cooper, looks cool in its original shape, with very clean and powerful Soundstream Audio System. 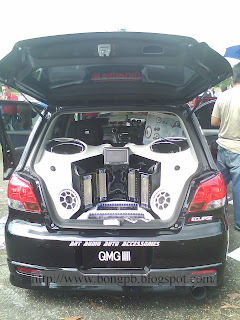 It uses Soundstream 15" Subwoofer with RMS 900watt and 1300Max, Reference R1 series which was boosted up with 2 very strong Soundstream PCA2000D MONOBLOCK CLASS D AMP, which delivers 2000 watt RMS each. Soundstream capacitor SCX-4 4 Farad capacitor is also used to enhance the subwoofer outout. 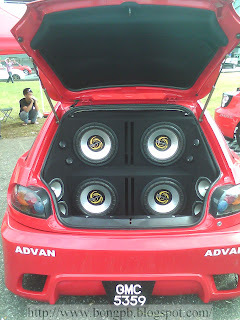 It also uses 2x Soundtream XTC480 for 4 sets of Soundstream 6.5" Picasso Component speakers. 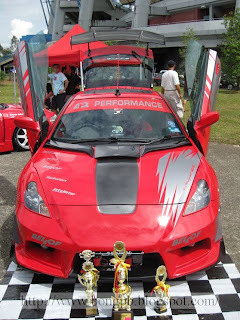 This is Toyota Celica, which has won a few prizes in its previous car show competitions. This is Perodua Kenari, with very extream body kits as well. Noticed the 2 Chinese words at the door there?It means "Money Come", funny huh? 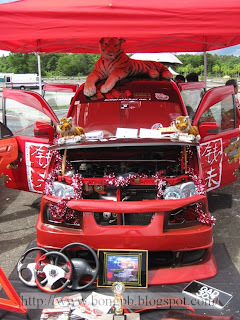 This show car belongs to the company "LuiLai", which means "Money Come" in Malaysia Hokkien Dialect. They are specialize in producing very fine and good quality vinyls. 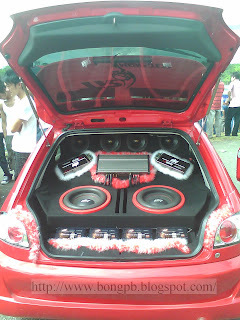 This is Mitsubishi Airtrek, which uses Helic as their Car Audio System, belongs to a Kuching Car Accessories Shop, Art Car Accessories. There are more photos with very nice body kits coming out soon. 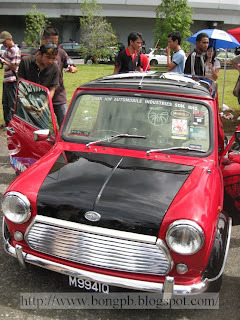 In near future there will be another Car Show in Kuching, which will be held in a larger scale. Each car accessory is made for purpose. Seat covers protects the seats from accident spilling of liquids and food items. Floor mats and carpets protects the car from dirt. GPS system helps you to reach the destination faster and parking system prevents the car from accidents while reversing.